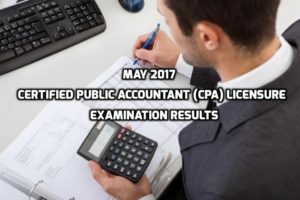 The Professional Regulation Commission announced the May 2017 Certified Public Accountant (CPA) Licensure Examination list of passers on Monday. According to the commission, about 3,389 passed the exam out of 9,645 takers. The Board of Accountancy administered the examination in the different assigned PRC test centers in Baguio City, Cagayan de Oro City, Cebu, Davao, Iloilo, Legazpi, Manila and in Tacloban from May 14-15 and May 21-22.